Channel set diamonds in stylish platinum with a gentle curve. 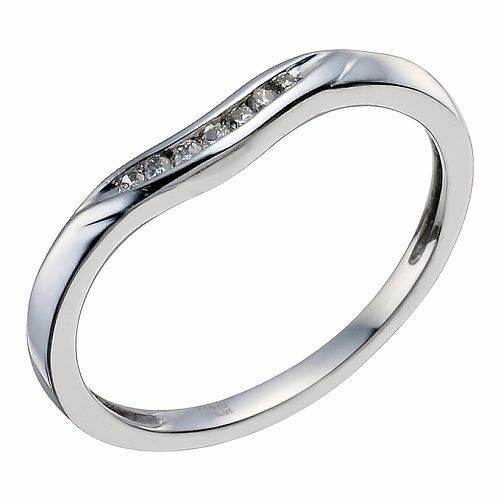 Platinum & Diamond Shaped Band is rated 5.0 out of 5 by 3. Rated 5 out of 5 by Anonymous from Really happy I was dismayed when I realized that I needed a platinum wedding ring to go with my engagement ring, as I'd set my heart on some sparkles. But with a platinum setting it was getting expensive. This is delicate, has just the right amount of sparkle to compliment my 3 stone engagement ring... and remarkably - it fitted the engagement ring perfectly. V happy. Rated 5 out of 5 by Anonymous from Excellent quality Got this as my wedding band, it's well made and has a nice weight to it. Complemented my engagement ring perfectly, 10/10.